No special equipment is required to make this wonderful recipe. 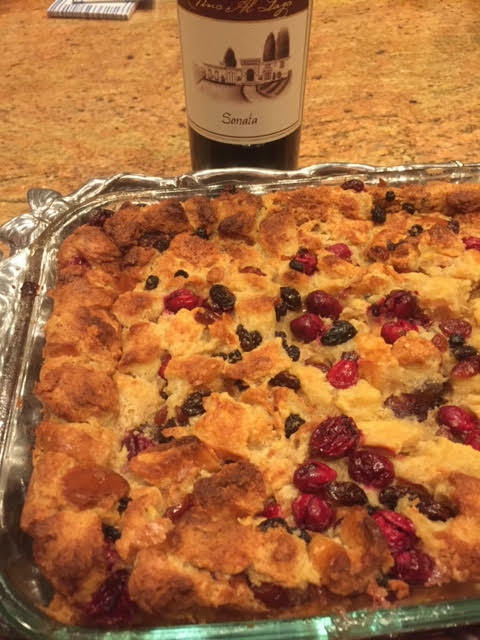 On the night before you are planning to make the bread pudding, soak the raisins and the dried cranberries in the brandy. On the next day, pre-heat the oven to 350 degrees, and toast the bread until golden brown (be careful that you do not burn it). This should take 10 to 15 minutes. Once the bread is golden brown, take it out of the oven and let it cool. Now, turn the oven to 375 degrees. While the bread is toasting, grease a 2 ½ to 3 quart baking dish. In a mixing bowl, whisk the beaten eggs, sugar (white and brown), vanilla, and cinnamon for a few minutes until well mixed. Stir in the melted butter, the pinch of salt, and the Half and Half cream. Once this mixture is well integrated, gently stir in the toasted bread cubes. Strain the soaked raisins and the soaked, dried cranberries (as a tip: keep the brandy for the sauce). Stir the fresh cranberries, the strained, soaked, dried cranberries, and the soaked raisins into the mixture. Lightly spoon the mixture into the greased baking dish. Let sit for about 15 minutes. Cook at 375 degrees for about 50 minutes to an hour – until it is set in the middle. If necessary, cover the pudding after about a half hour if the top is starting to brown too much. Let the pudding stand for a few minutes (about 10) before serving. Serve with the caramel brandy sauce. Pour the whipping cream into a large saucepan and heat to a very light boil. Add the sugar, and stir until the mixture is smooth and the sugar is dissolved. This should be about four to five minutes. Once the sugar is dissolved and the mixture is smooth, remove from the heat and gradually stir in the butter and the brandy. Let cool for about 10 to 15 minutes. Serve over the cranberry bread pudding.